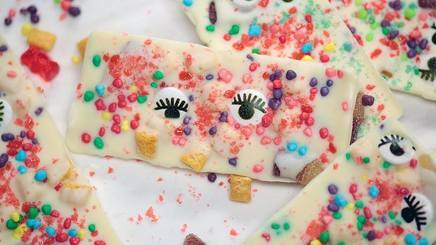 White chocolate pop rocks bars! Last week while walking the boardwalk with my hubby, we came across a huge candy store. I mean, candy from the floor to the ceiling! Every kind of candy imaginable! I was brought back to my childhood in the blink of an eye! I found a jar of Pop Rocks! OMG! I used to love these! Especially sharing them with people who have never had them before! Anyway, I bought a bunch. So, I started searching for recipes that I can utilize these babies! And, here it is! This recipe has you tempering using a double boiler, but I find it is much easier using my chocolate tempering machine. To each his own!